When you have pets in the home it is important to have your carpets cleaned often. Even if your pets are only in the home for a short period of time you should still consider carpet cleaning. Pets drag in so much from the outside into your home, they shed, and soil the carpets. When you notice these things you think its time for a good carpet cleaning but what you may not know is that your basic carpet cleaning will not take care of every pet stain or odor. 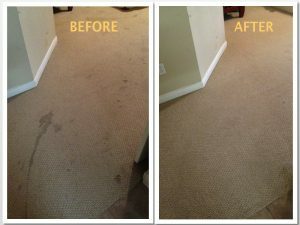 Carpet cleaning solutions are a general cleaning method designed to remove your more common stains such as food, drinks, and dirt. It is not designed to tackle some of the harsher things such as pet odor and soiling. This is why many carpet cleaners offer an additional pet treatment cleaning. If you have pets you will more then likely be interested in having this service performed. Your general carpet cleaning solutions usually include enzymes which can help with pet soiling depending on the severity and protein within the urine. However, if your pets have repeatedly soiled the carpets then you will definitely want the pet treatment. With Beyer Carpet Cleaning their pet treatment includes enzymes and concentrated oxidants to help remove stains. It also includes odorcide which is the strongest form of odor eliminator in the carpet cleaning industry. Odorcide can eliminate most odors such as pet odor, smoke odors, or just funky smells. Combined together these solutions are guaranteed to remove 80-90% of odor and stains r at least lessen the visibility of stains. There is no 100% guarantee because there is no way of knowing how truly serious the condition of ones carpet. If the soiling has gone through the carpet and into the padding chances are that stains will either appear to be gone for a short period of time and then come back or won’t budge at all. In these type of situations it is best to just replace or patch that area of the carpet or have your carpet cleaned several times before it can be completely gone. Every home is different as well as every pet situation but if you want to get the best cleaning for your home when you have pets always ask for the pet treatment. It will cost you a little more but in the end it will be totally worth it. Beyer Carpet Cleaning is currently offering an excellent sale on pet treatment. You can add pet treatment onto any full service carpet cleaning package for either $49 for one room or $99 for all your rooms. It’s a great deal that can’t be beat!